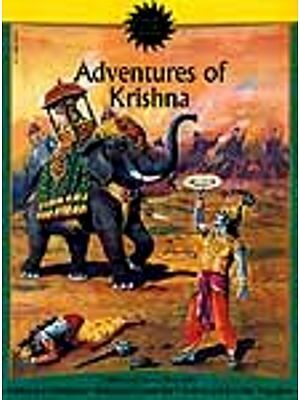 This book has been extensively researched and the years of Krishna’s life have been threaded together from... Mahabharata, Shatapatha Brahmana, Aitareya Aaranyaka, Nirukta, Ashthadhyayi, Garga Samhita, Jataka Katha Arthashastra, Indika, Harivamsa Purana, Vishnu Purana Mahabhashya, Padma Purana, Markandeya Purana, Kurma Purana, Bhagavad Purana, Geet Govinda, Harivamsa Purana of the Jains, sur Sagar, Guru Granth Sahib, Prem Sagar Padavali, Shree Prem sudha Sagar, Sukh Sagar.... in such psychological manner that you feel transformed as his life unfolds. In his voluminous works, Deep Trivedi has extensively explained Nature, its laws, its behaviour, its psychology and the effect it has on human life. No aspect of life and human psychology has been left untouched by him. 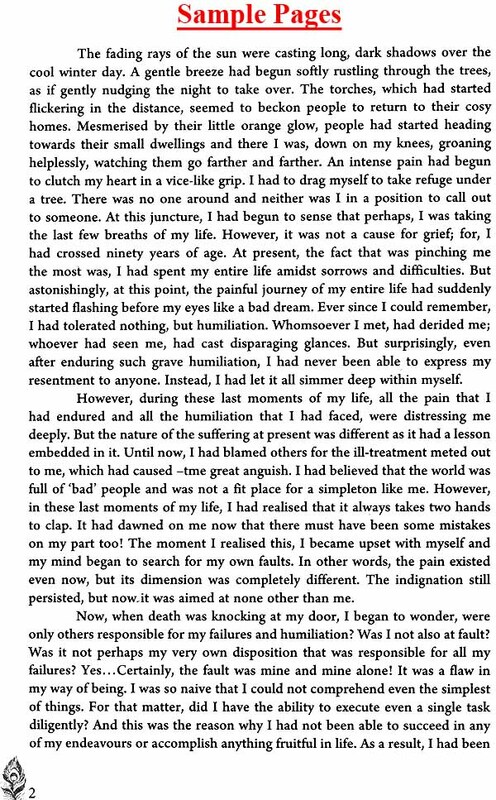 He states that the lack of psychological knowledge and understanding is the sole reason for all the sorrows and failures pervading human life. An author of the bestseller 'I am The Mind' and numerous other books, he is known for his special ability to touch upon the deepest aspects of life and explain them in a very lucid language, leaving no scope for any ambiguity. 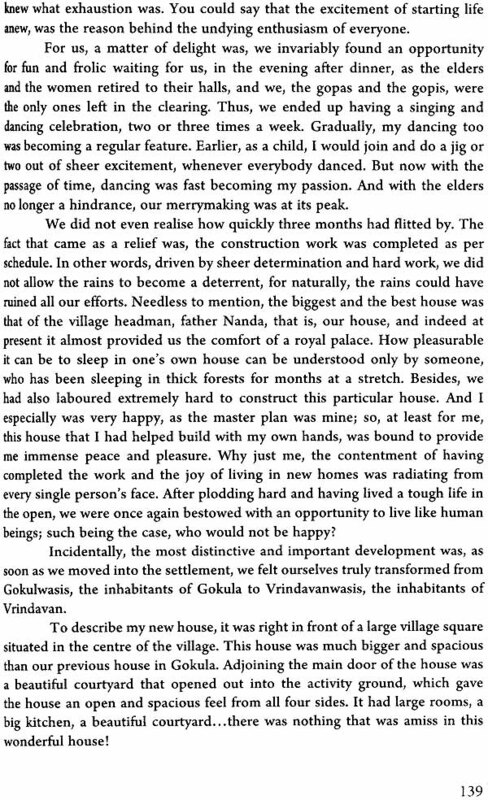 His command over the biggest psychologies of life can be gauged by the fact that he holds the Record for 'Maximum Lectures on Human Life', 'Maximum Lectures on Psychological Aspects ofTao Te Ching' and 'Maximum Lectures on Bhagavad Gita', which is 168 hrs, 28 mins, 50 secs in 58 days in Asia Book of Records and India Book of Records. These lectures have been delivered in front of a live audience across India. His distinct spiritual-psychological language and expression in his writings and lectures, begins to have an instant effect on the mind of the reader or listener, which makes Deep Trivedi a pioneer in this field. 'Krishna' is a name synonymous with victory and flamboyance, yet he has always been an enigma. The diverse facets of his personality make it difficult or rather impossible for anyone to grasp his personality in its entirety. Yet, the love showered on Krishna and the manner in which he is revered is nothing short of phenomenal. Such is the uniqueness of his personality that for some, he is a lover, while for others he is a savant; some believe him to be an ascetic while others see him as a Karmaveer or a man of heroic deeds. Interestingly, whichever aspect of his personality one chooses to recognise or believe in, one cannot help but be smitten by it; although it is not that everyone is equally enchanted by him, after all, he also had - and still has - his share of detractors. His personality has such a paradoxical effect on people that on one hand, some learned followers of the Hindu religion have hailed him as the only 'complete-avatar', and on the other, the authors of Jain scriptures, as per their own understanding, reasons and perceptions have relegated him to hell! But Krishna's personality is not contingent on any of these views. Who thinks what, how does it matter to Krishna or his personality? Even though Krishna's personality does not depend on others' perceptions about him, in the light of these contradictions, it is imperative to understand what exactly his personality was. It is also essential to know how he rose to become the King of Dwarka despite being born in a dungeon and having grown up in the shadow of death. Besides this, there are several other questions that invariably pique one's interest when talking about Krishna. It would also be interesting to know what kind of love he and Radha shared. Why did he leave Radha? Why did she roam the streets of Brij for the rest of her life like a woman madly consumed by her love for Krishna, who never returned? At the same time, it is important to decipher the mystery of this awe-inspiring personality, who, on one hand, has been accused of triggering an epic war like the Mahabharata, and on the other, has earned the distinction of being the supremely wise one who has imparted the words of supreme wisdom, which we know as the Bhagavad Gita. Krishna is such a multi-dimensional personality, that there has never been a dearth of names he has been addressed with such as thief, manipulator, liar and trickster, and at the same time, a colossal number of people view him as Vasudeva, Madhusudan, Kanha, a supreme being and a supremely wise man! The numerous other questions which invariably make people curious about Krishna are: How many times did he marry? How many children did he have? 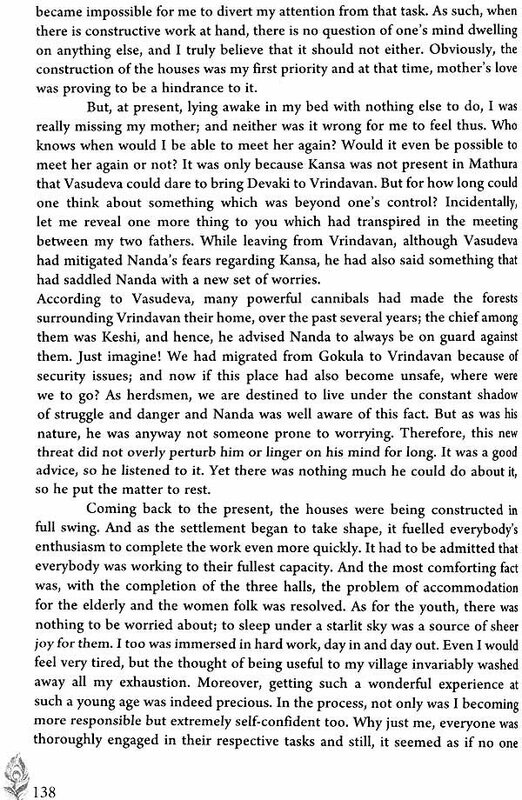 What exactly is Yadavasthali.? This book contains the answers to all these questions. 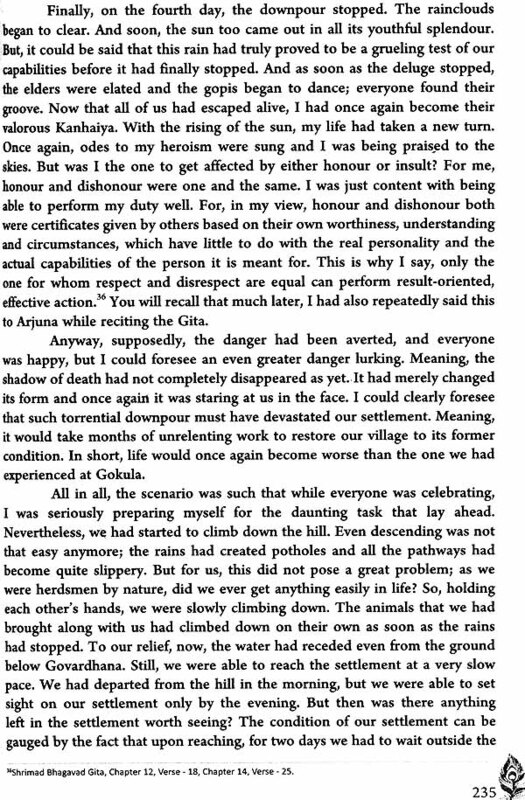 I have penned this work only after a long and thorough study of all the available scriptures related to Krishna such as Harivamsa Puran, Vishnu Puran, Shiva Puran, Shrimadbhagvat Puran, Markandey Puran, Kurma Puran, Bhavishya Puran, Mahabharat among other historical texts, and after grasping the practical and psychological aspects of all the dialogues and incidents mentioned therein. 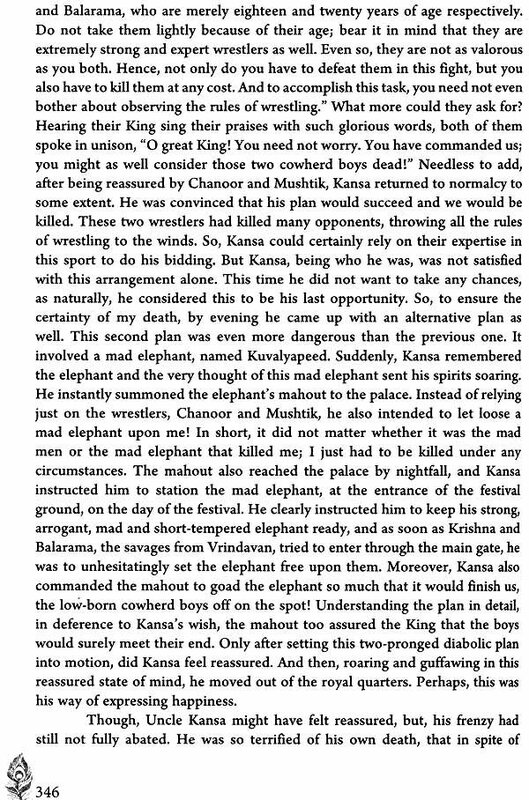 I have condensed the 108 years of Krishna's life and all its significant events into this book, endeavouring to keep this account close to the true psychology of Krishna, and needless to say, I have given it the form of a story to make it an interesting read. 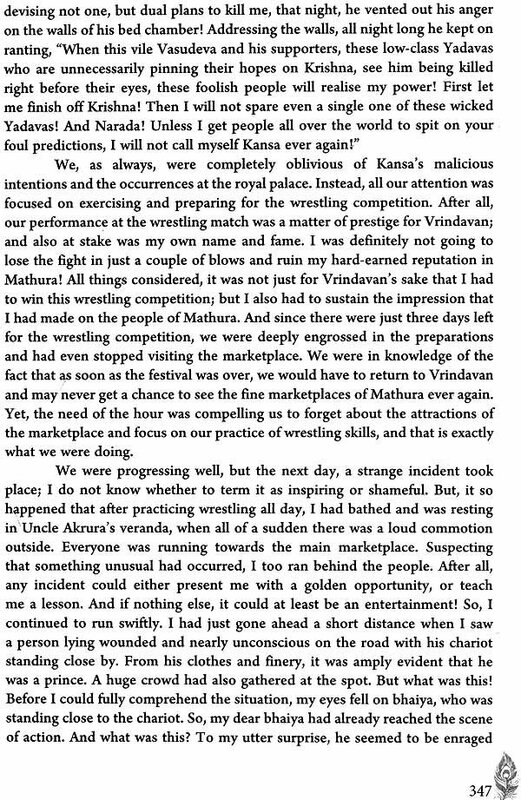 I have tried to make the events in Krishna's life come alive for the readers, by elaborating upon the incidents as much as possible, keeping in mind the requirements of modern literature. I am a psychologist and a strong adherent of spiritual psychodynamics and if viewed from a psychological perspective, whether it is an individual or his life or any kind of incident occurring in his life, eventually, everything is a part of a psychological sequence. And Krishna's personality, in spite of its great aspects and complexities, is no exception to this. Even though psychologically, he has reached the greatest of heights, his state of mind is certainly not beyond comprehension. And I believe that the causes behind the event are far more significant than the event itself. Rather than knowing what a person has done, it is more important to know the reasons why he has done it. 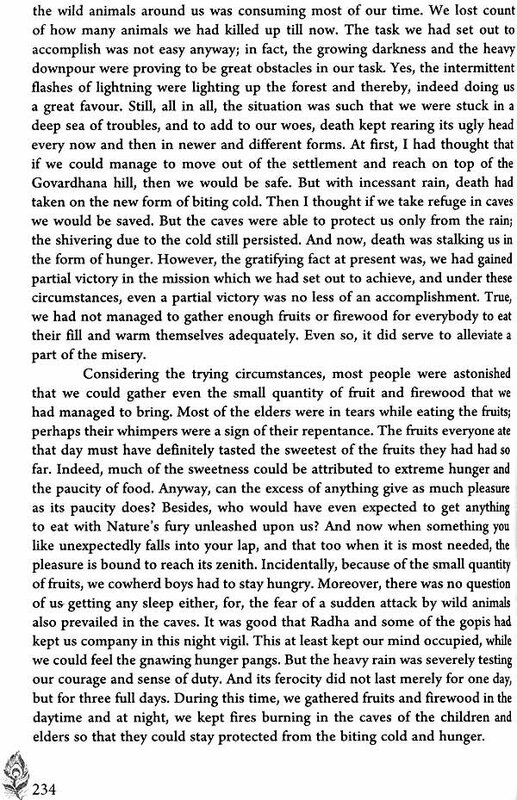 Therefore, in this book, I have given equal importance to Krishna's life as well as his state of mind. 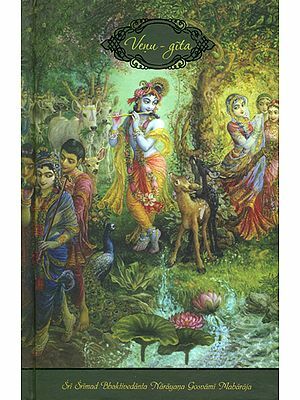 I am sure, this book will not only shed light on Krishna's life, but will also acquaint you with Krishna's personality and his evolution. As far as I am concerned, it is the Bhagavad Gita which has transformed my life and taken it to new heights; in fact, Krishna and the Bhagavad Gita are firmly rooted in my heart in their true essence. But in a departure from common belief, I am of the firm opinion that hailing someone as God creates a distance between him and us. Declaring someone as God incarnate is a grave insult to the effort that he has put in to nurture and enhance his potential, his wisdom, his capabilities and his spirit of inquiry. Because the truth is, all those who have accomplished great feats in this world have done it on the strength of their intelligence, capabilities and sheer hard work. It is very convenient to say that Krishna became great because he was destined to. Possibly, it may give you an excuse to conceal your inability to attain greatness. But the truth is, by linking the greatness of an individual to his destiny, we insult his skills and hard work. That is the reason why, in this book, I have attempted to shed light and elaborate upon all the virtues of Krishna, beginning from his phenomenal grasping power. And it is only by grasping the true essence of his life that we can learn from him and imbibe his qualities. Krishna too learnt from every person and each incident that came into his life. He has scaled the peaks of love, concentration, karma or action and wisdom, solely on the strength of his spirit of inquiry and determination. And this is what is worth learning from his life. 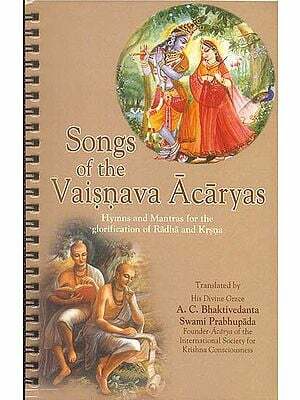 As a matter of fact, this book, along with a complete account of his long, eventful life, contains the entire journey of his transformation from a simple cowherd boy 'Krishna' to the supremely powerful 'Jai Shri Krishna'. I affirm with conviction that yes, Krishna is the only 'complete' personality in the history of mankind; but I assert even more firmly that he has reached this state solely due to his diligence and virtues. Therefore, I salute not only him, but also his diligence and intrinsic qualities. 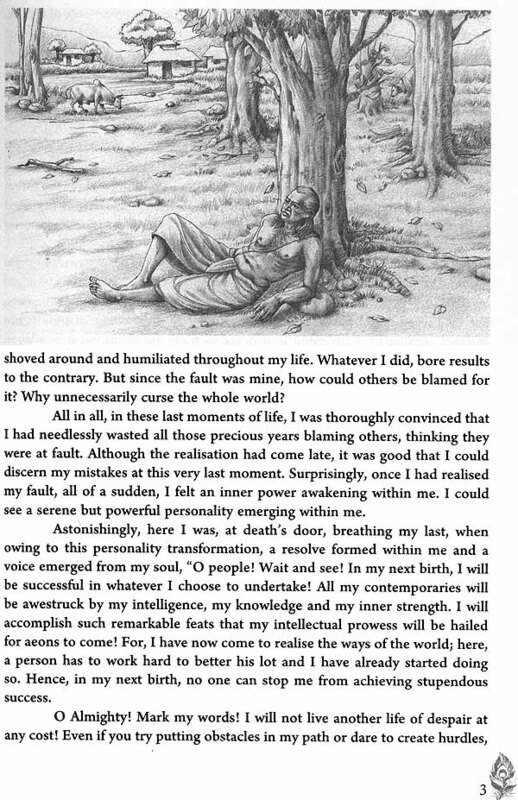 And as for me, I am determined to imbibe his qualities and endeavour to bridge the gap between his psychology and mine, so that I too emerge victorious at every juncture of my life; so that I too can spend my life in joy and bliss, and so that, inspired by him, my life too can be effectively utilised to help humanity, just like his life did. Researching on and writing about Krishna has taken me on an incredibly rewarding journey of self-discovery and I hope with all my heart that this book helps you embark on an equally enriching voyage. With this ardent wish, I offer this humble labour of love to you.